Rosa Mexicano serves authentic, Mexican cuisine using the finest ingredients, traditional cooking techniques, and regional Mexican recipes bursting with flavor! Signature items include the Guacamole en Molcajete – which is prepared tableside – and the frozen Pomegranate Margarita. The fun, festive, and stylish atmosphere of the restaurant is perfect for lunch, dinner, or private events. 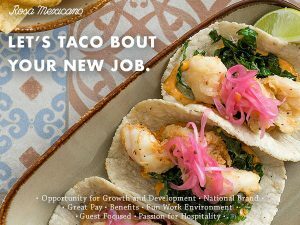 Interested in working for Rosa Mexicano Restaurant? We are hiring! We are hiring for the Front of House and Back of House. Please follow the above links to apply! For intimate dinner parties or the most elaborate of gatherings, Rosa Mexicano can accommodate any type of event you’re planning. Our authentic, regionally-inspired Mexican cuising, cocktails and spirits – all served with Latin hospitality – will make for a truly unforgettable fiesta. Let our expert events specialists create a unique Rosa Mexicano experience in your office space or at your home. Rosa Mexicano is available for private events 7 days a week, 365 days a year. Black bean soup with poached eggs, our Guava-Grapefruit Spritz y mas! The perfect sipping mezcal, our super premium agave spirit was made in partnership with our friends at Fidencio. so be sure to plan your visit soon – before this very limited mezcal runs out! Mix up your routine and enjoy freshly prepared lunch in our dining room. Great for those on a tight schedule, our chef’s rotating menus features seasonally changing dishes that you a chance to experience something new!